This is one of those happy-accident types of recipes! 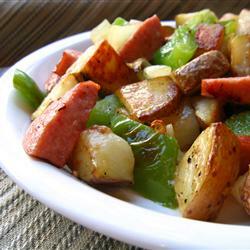 I had one kielbasa link and a few potatoes, so I just threw it together. Success! Fry up the potatoes until they are done and nicely crisped on all sides. Next up, the kielbasa…brown both sides of the kielbasa pieces until crisp and golden. Saute the green pepper for 2 minutes. Dash with salt and pepper and serve. Goes great with a side of eggs, prepared to your liking!